Like with any leak, water pressure throughout the pipes will be lost. This causes the water at the faucet to come out at reduced pressure. Instead of a stream of rushing water, you may see it reduced to a dribble. Notice a particularly cold or warm spot on your floor while walking across the kitchen? It might also be confirmed by a pet who has suddenly decided to use that spot as their new napping place. This is most likely the place where a leak has broken out beneath the ground. Whether it’s hot or cold will help you determine which pipe has broken. 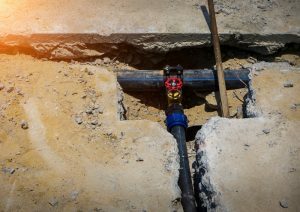 Some underground leaks can occur just outside the home but close enough to the perimeter to be considered a slab leak. If this is the case, you’ll be able to feel a portion of the lawn that has become saturated with all the leaking water. If you see a sudden spike in your water bill, you can be certain that you have a leak of some kind. While that isn’t enough to guarantee that it’s a slab leak in particular, it’s nonetheless a sign that you should never ignore. Unfortunately, the unusually high water bill is one of the most common ways that homeowners realize they have a leak, as well as one of the most expensive. If this is the case in your home, turn off the water immediately and have a plumber come track down the source. As the soil becomes saturated with water from the leak, it can eventually push the foundational concrete slabs upwards. This is enough force to create cracks through tile or concrete flooring. For the same reason as cracks on the floor, cracks can also form on the walls at the baseboard level. This might be due to two different things. In one case, it could be that water leaking from the ground has made it into your home, created damp spaces, and is now fostering the growth of mold and mildew. This is especially likely in our humid Florida climate. The other case is even less favorable: it could be due to a broken sewer line. At this point, the leak has become a health hazard and needs to be dealt with immediately. If the leak has broken out inside of your home, give us a call and we’ll tell you what to do next. Do you have a leak under your home? We can handle that. Contact Bruno Total Home Performance today to schedule a service.